Nottingham was electric with excitement as its four day event culminated in the St .Patricks Day festivities. Nottingham’s 16thannual parade twinned with County Donegal this year, with John Doherty leading the procession. 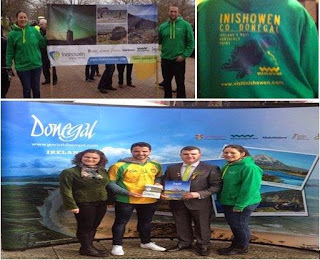 At his side, representatives from Inishowen Tourism held a banner displaying the spectacular scenes and experiences that Inishowen has to offer the potential visitor. A crowd of approximately 8,000 gathered along the route which left the city’s Forest Recreation Ground. Irish community groups formed marching bands and various floats for a 12noon departure. Arrays of contrasting “Greens” were celebrated through music, culture, and merry-making throughout the day. 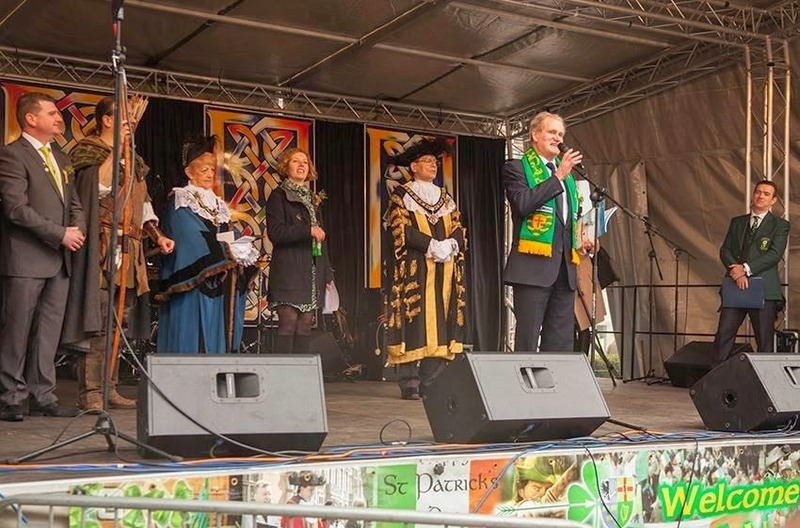 Standing alongside local organisations, Inishowen Tourism shared the Shamrock, and traditional cuisine, adding a Donegal flavour to the Nottingham parade. The organiser’s spokesperson deemed the event a huge success. Guests in attendance such as Cllrs John O’Donnell, Ian McGarvey and Colin McNulty, and Caroline Savage, the Commercial Attaché of the Irish Embassy were greeted with a warm address from Ian Malcolm, The Lord Mayor of Nottingham. InishowenTourism team also attended the third biggest parade in the world; Manchester Irish Festival 2015, coupled with Nottingham’s celebrations. It attracted over 200,000 people at the 17 day celebration. The evening civil reception was attended by the manager of Inishowen Tourism; Siobhan Kelly stated “it was an enjoyable evening, began with a welcome address, followed by guest celebrity speeches, and concluded with Joe Keegan of “the voice” singing, The Hills of Donegal. The Manchester Parade was held on Sunday 15th of March, setting off from the Irish World Heritage Centre at 11.30am. Each county was represented, and footfall, including the Inishowen Diaspora made a special effort to visit the stand to share their stories, and enthusiasm at seeing Inishowen represented in the UK. The beer tent and music marquee in Albert Square bustled with “the craic” of the day and remained open for the festivities throughout. Irish Bars in the centre of Manchester served food. Granny Murphy’s Irish stew and Guinness Basted Hog Roast were the favourites of the day. Inishowen Tourism stand was a hive of activity, celebrity guests Joe Keegan, from “the voice” called by, and Sean Ward, better known as Callum in Coronation Street stated “images of Inishowen looked amazing, definitely worth a visit!”.